Department of Art | FSU Art Student Drexston Redway Featured on FSU Profile! 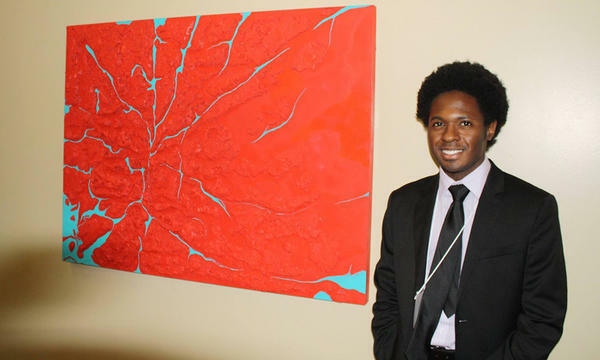 Home » News » FSU Art Student Drexston Redway Featured on FSU Profile! FSU Art Student Drexston Redway Featured on FSU Profile! Drexston Redway, a junior studying studio art and marketing, reflected the link between poverty and being a minority through personal and local experiences, and how it affects young women in those situations. His research project embraced the idea that statistics and data can be represented through art and spark critical thinking about the community and gender issues. In the final project, Redway layered cork on plywood to display areas of Tallahassee suffering from large amounts of poverty. The higher the cork, the more poverty was in that area. He also studied the city’s racial diversity to find the link between poverty and race. Redway aims to teach at the college level and continue to research, and advance conversations about minorities and poverty. His research was funded by FSU’s Public Service Research Fellowship, which supports research of a community problem that directly benefits community-based organizations, programs, and/or specific community groups in a domestic or international setting. To read more about Drexton, visit FSU Profiles!